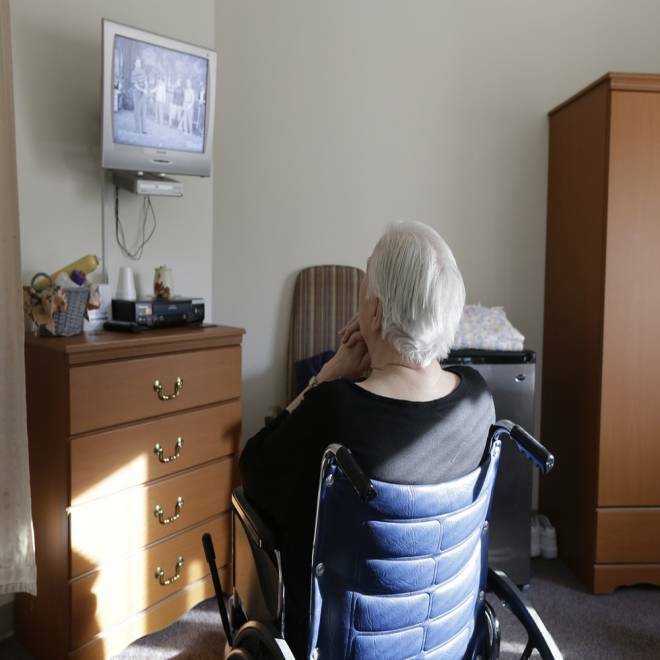 An elderly woman who has suffered abuse by a relative watches "I Love Lucy" on a television inside her room at Cedar Village retirement community, in Mason, Ohio. The Shalom Center that is a part of the community helps the woman by offering shelter, along with medical, psychological and legal help, to elderly abuse victims in this northern Cincinnati suburb. The center asked that her identity be protected for this story. She raises her hands to her snow-white hair in a gesture of frustrated bewilderment, then slowly lowers them to cover eyes filling with tears. The woman, in her 70s, is trying to explain how she wound up in a shelter that could well be where she spends the rest of her life. While the woman was living with a close family member, officials at the Shalom Center say, her money was being drained away by people overcharging for her grocery shopping, while her body and spirit were sapped by physical neglect and emotional torment. She says she was usually ordered to "go to bed," where she lay in a dark room, upset, unable to sleep. A family member “just yelled at me all the time. Screamed at me, cussed me out," the woman says. "I don't know what happened. She just got tired of me, I guess." The Shalom Center offers shelter, along with medical, psychological and legal help, to elderly abuse victims in this northern Cincinnati suburb. It is among a handful in the country that provide sanctuary from such treatment, a problem experts say is growing along with the age of the nation's population. The number of Americans 65 and over is projected to nearly double by 2030 because of the 74 million baby boomers born in 1946-64, and the number of people 85 and over is increasing at an even faster rate. As many as 2 million seniors are abused, exploited or neglected every year, judging by available statistics and surveys, but experts say there could be many more. Some research indicates that one in 10 seniors have suffered some form of abuse at least once. "That's a big number," said Sharon Merriman-Nai, project director of the Clearinghouse on Abuse and Neglect of the Elderly, based at the University of Delaware. "It's a huge issue, and it's just going to get bigger." Recognition of and mechanisms for dealing with elder abuse are many years behind strides that have been made in child abuse awareness and protection, experts say. Getting comprehensive numbers of the abused is complicated, experts say, because the vast majority of cases go unreported out of embarrassment, fear of being cut off from family — most abuse is at the hands of relatives — or confusion about what has happened. Abuse sometimes comes to light only by chance. County-level adult protective services caseworkers can get anonymous tips. In one recent Ohio case, a hairstylist noticed her elderly client was wincing in pain and got her to acknowledge she had been hit in the ribs by a relative. Another Shalom Center patient was referred by sheriff's detectives who said his son beat him. "Are these older people going to be allowed to live their lives the way they deserve to?" said Carol Silver Elliott, CEO of the Cedar Village retirement community, of which the Shalom Center is a part. "We really are not addressing it as a society the way we should." The Obama administration has said it has increased its focus on protecting American seniors by establishing a national resource center and a consumer protection office, among other steps. But needs are growing at a time when government spending on social services is being cut on many levels or not keeping up with demand. In Ohio, slowly recovering from the recession, budgets have been slashed in such areas as staffs that investigate elderly abuse cases. The Job and Family Services agency in Hamilton County in Cincinnati has about half the staff it had in 2009, spokesman Brian Gregg said. Even as national statistics indicate elder abuse is increasing, the number of elder abuse cases the agency can probe is lower, down from 574 cases in 2009 to 477 last year, he said. There are no longer enough adult protective services investigators to routinely check on older adults unless there is a specific report of abuse or neglect. "We do the best we can down here," Gregg said, noting that the agency has a hotline to take anonymous reports and that it is seeing more financial scams targeting elderly people. The price for not getting ahead of the problem and preventing abuse of people who would otherwise be healthy and financially stable will be high, warned Joy Solomon, a former Manhattan assistant prosecutor who helped pioneer elder abuse shelters with the Weinberg Center for Elder Abuse Prevention, which opened in 2005 at the Hebrew Home community in New York City. "My argument always is, if all you do is come in when the crisis has occurred, it is much more costly than preventative care," said Solomon, director of the shelter, which takes in about 15 people a year. "We're going to have to pay for it anyway." She and others in the field say the first steps are to raise public awareness and train police, lawyers, criminal justice officials and others to recognize and respond to signs of abuse. Prosecutors often have been reluctant to purse elder abuse cases, which can be complex because of medical and financial complications, the witness' ability to testify or reluctance to testify against relatives, according to research for the National Institute of Justice. In suburban Los Angeles, Orange County started an Elder Abuse Forensic Center nearly 10 years ago; it helps police, geriatrics specialists, lawyers and social services workers coordinate efforts to identify, investigate and prosecute abuse cases. New York City started its Elder Abuse Center to 2009 to bring a multi-organization approach to the problem, saying nearly 100,000 older people are abused in their homes in the city alone. While he was Ohio's attorney general in 2009, Richard Cordray, now director of the federal Consumer Financial Protection Bureau, started the state Elder Abuse Commission, something current Attorney General Mike DeWine has continued. The commission has focused on training and education and hopes to launch a public awareness campaign this year, said Ursel McElroy, the longtime adult protection services investigator who leads it. The commission also has been pushing for legislation to improve legal protection and abuse prevention, expand training, and improve statistical data. In New York, part of the Weinberg Center's mission is to help other communities replicate it. It has assisted shelter startups in upstate New York, Connecticut, Rhode Island and Minnesota along with the Shalom Center in Ohio. The center marked its anniversary in January. While more than 40 people have been referred to the nonprofit, faith-based center, only three have gone through with admittance, signs of the reluctance of people who fear losing family relationships — even if they are bad — or the feeling of being at home. Set up as a "virtual shelter" because victims are integrated into the full Cedar Village retirement community, it is meant to provide 60- to 90-day emergency stays while caseworkers provide help and seek out the best alternative, such as with a different caregiver or relative. In the case of the woman who complained of abuse in a relative's home, a call to adult protective services by someone familiar with her led to an investigation and her referral to the shelter. She has little money, health problems and few alternatives, and after a while, she asked if she could stay at Cedar Village permanently. Caseworkers and officials at the nonprofit, faith-based home agreed that was the best place for her. The center asked that her identity be protected for this story because the close relatives who allegedly abused her don't know where she is. She paints, plays in a residents' bell choir, plays bingo with others regularly, and has her own room and TV to watch favorites such as "Ellen" and reruns of "I Love Lucy." The healthy diet at the center means she misses some of her favorite foods — beans and corn bread, fried pork chops. But she loves the tuna salad, the group activities and having a life with people who care about her. "I've got quite a few friends," she says. "They're just nice people here. I have somebody to talk to, and I appreciate it."